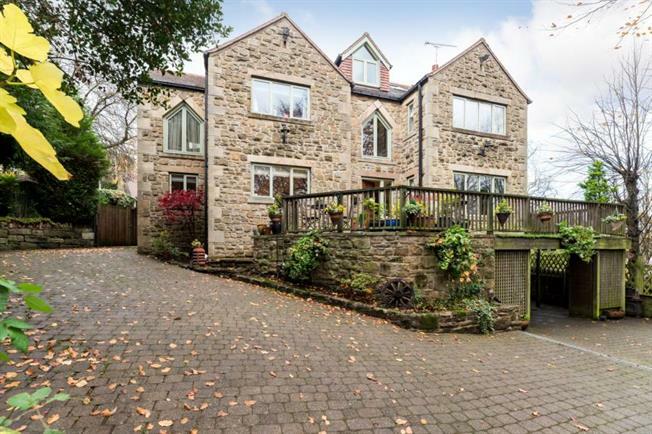 5 Bedroom Detached House For Sale in South Yorkshire for Guide Price £795,000. A rare opportunity has arisen to acquire this FIVE DOUBLE BEDROOM DETACHED FAMILY HOME available to market have NO ONWARD CHAIN INVOLVED. Set in just under half an acre, nestled away behind double electric gates accessed via a private block paved driveway providing off road parking for up to 8 vehicles, setback and raised from Manchester Road enjoying this very private plot and position is this stunning and most luxurious five double bedroom outstanding stone built detached family home which was constructed in 1995 by the present owners which must be viewed to be fully appreciated. Finished to a high specification with no expense spared in order to create this fabulous family home which offers extremely well appointed and proportioned accommodation that has been skilfully arranged over all three floors, benefitting from ample reception space, large family bathroom and two en suite facilities as well as an integral double length tandem garage, workshop having under floor heating, double car port, double glazing, gas fired central heating and beautiful enclosed low maintenance walled garden with raised stocked borders providing great entertainment area accessed via the bifold doors from the conservatory. The property also offers scope to add a sixth bedroom with en-suite mirroring bedroom five (subject to consents) and has an entry/exit burglar alarm which is on a yearly service contract. Situated only a stone's throw from Broomhill and its wide range of local amenities, close to principle Hospitals in Sheffield and Universities alike and having sought after and highly regarded school catchment as well as being on the doorstep of most of Sheffield's independent school, yet only a 20 minute walk into open countryside. The accommodation comprises: reception hallway with amtico floor, ground floor WC, cloak cupboard and stairs rise to the first floor landing. Lounge with the focal point of the room being the feature wall having a built area for a TV with surround sound system. Snug/family room with a door leading into the study/home office. kitchen fitted with an extensive & attractive range of wall and base units with granite work surfaces, inset Belfast sink, breakfast bar area and integrated appliances to include multi fuel range master with extractor fan above, dishwasher and fridge. Open plan to the dining room having built in pantry and bifold doors leading to the conservatory which has a lantern roof sky light also having bifold doors into the rear garden. The utility room benefits from a range of wall and base units housing the boiler as well as having space and plumbing for an automatic washing machine & tumble dryer, as well as space & plumbing for an American style fridge/freezer. Solid oak floor leads through from the kitchen, dining, conservatory and utility room. First floor landing: master bedroom with dressing room and en suite shower room, three further double bedrooms and large family bathroom comprising: wash hand basin, high flush wc, free standing double ended bath with mixer tap shower attachment, double shower cubicle having mains shower within. Tiling to the splash backs, amtico floor and airing cupboard. Second floor landing open plan into a great living area ideal for a teenager looking for their own retreat, having both front and rear facing Dorma windows and a door leads into the double bedroom five with built in wardrobes and en suite bathroom comprising: roll top claw foot bath with mixer tap shower attachment, wash hand basin, low flush wc, tiling to the splash backs and floor. Externally: to the front of the property is a raised flagged terraced with artificial grassed area, an idyllic area to sit and enjoy a coffee in the morning sun whilst watching the wide variety of birds, wildlife and squirrels, as well as having two storage sheds beneath and access to the integral garage. A double gate leads from the side of the property to the rear enclosed garden. Several outdoor taps provide running water, as well as ample external power points.